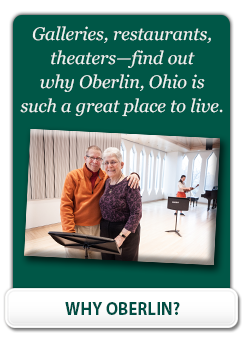 Kendal at Oberlin offers a vibrant, resident-driven lifestyle with attractive living spaces for independent living, residential services, amenities, and coordinated on-site health care for life. Senior living at Kendal means a wealth of opportunities for art and music, education and involvement. People have moved to Kendal at Oberlin from 32 different states and the District of Columbia. Nearby Oberlin College and its Conservatory of Music are less than one mile away. Do you enjoy classical music? Fine art? The college presents more than 500 concerts and lectures in the academic year and Kendal residents are welcomed visitors on the campus. Concerts and lectures are also organized by committees of the Kendal at Oberlin Residents Association(KORA). Metropolitan entertainment is a short drive away in Cleveland, Ohio. Group events include trips to the Cleveland Orchestra, museums and other area attractions. Hopkins international airport is easily accessible, so you can continue your travels and adventures. Our campus includes 107 beautiful acres, including ponds and wetlands, wooded areas and walking trails. Kendal and Oberlin are both very walkable communities. Cottage homes and apartments designed for senior living are connected to the community center by a system of covered walkways. Or plan to bring your bicycle – it’s an easy way to get around.